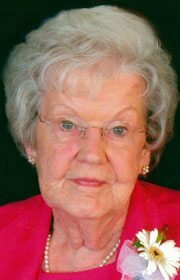 Lillian E. Benjamin, 93, Fort Col­lins, Colo­rado, formerly of Humboldt died Mon­day, July 10, 2017. Services will be held 2:00 p.m., Saturday, July 15, 2017, at the First Lutheran Church, Gilmore City, with burial to follow in Marble Valley Cemetery. Visitation is from 1:00-2:00 p.m. Saturday prior to services at the church. Lillian Esther Grove, youngest daughter of James E. and Grace (Calhoun) Grove, was born April 20, 1924. On April 29, 1945, Lillian married Ted Benjamin. They made their home and raised their four daughters on the family farm near Bradgate. Survivors include three daughters, Pamela (Vern) Nedved of Humboldt, Iowa, Teresa (Dave) Dunn of Fort Collins, Colorado, and Marcia (Ken) Javor of Highland Village, Texas, 10 grandchildren, and 12 great grandchildren, and a brother, Gail (Carol) Grove of Prior Lake, Minnesota. Lillian was preceded in death by her husband of 71 years, their daughter Linda, her parents, and 11 brothers and sisters.